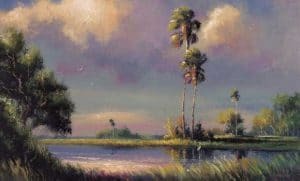 In the early 1950’s through the 1980’s a group of twenty-six African-American artists known as the "Florida Highwaymen" used vivid and bright colors to display the beautiful untouched Florida landscape. The Florida Highwaymen painted wind-bent palm trees, serene sunsets, churning oceans and bright red Poinciana trees. They painted from their garages and back yards on inexpensive Upson board and then on the weekends they would travel and sell their Highwaymen paintings to hotels, offices, businesses and individuals who appreciated the artwork for around $25 a piece. Collecting Florida Highwaymen art has become an exciting, but often expensive, hobby. The market for an original work of art by a Florida Highwayman can easily bring $5,000 or more. Some of the Highwaymen who are still living have resumed painting to meet the continuing demand for their work. Please take your time to browse our site for more information, or search above to find exactly what you are looking for.